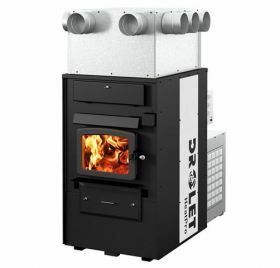 The HeatPro, one of Drolet's newest high efficiency wood furnace, offers you the power, flexibility and reliability you are looking for to heat your home. In fact, this high tech wood furnace has an adjustable air plenum which can host between 6 and 10 outlets for better air distribution in the house. Among its numerous benefits, this furnace can heat up to 3,500 square feet thanks to its 1,900 CFM premium blower and provides burn time up to 12 hours. Logs up to 24 inches long can also fit in the large 4.9 cubic feet firebox! The Heatpro, which has a maximum input capacity of 421,000 BTU, can be installed as a stand-alone or as an add-on furnace. Consumes up to 30% less wood compared to a conventional furnace. An optional thermostat (recommended) can be installed for an automatic adjustment of the combustion air supply and the motorized air damper can be manually operated on and off for a more precise combustion control. (1) Based on delivered heat output. (2) This appliance is officially tested and certified by an independent agency. (3) Values are as measured per CSA B415.1-10, except for the recommended heating area, firebox volume, maximum burn time and maximum input capacity. Performances based on a fuel load prescribed by the standard at 10 lb/ cubic feet and with a moisture content between 18% and 28%. (*) Recommended heating area and maximum burn time may vary subject to location in home, chimney draft, heat loss factors, climate, fuel type and other variables. The recommended heating area for a given appliance is defined by the manufacturer as its capacity to maintain a minimum acceptable temperature considering that the space configuration and the presence of heat distribution systems have a significant impact in making heat circulation optimum. 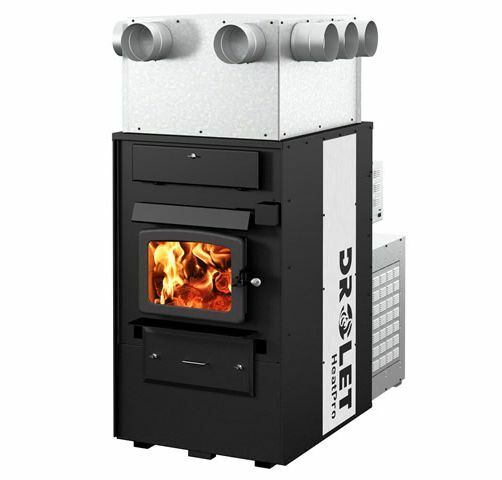 (4) Input value at 10 lb/ cubic feet fuel loading density and dry energy value of 8,600 BTU/lb. (5) Overall : Radiated and delivered heat together at 10 lb/ cubic feet fuel loading density over one total burn cycle. (6) Efficiency based on radiated and delivered heat when allowing cycling from high to low burn to simulate thermostat demand. (7) Higher Heating Value of the fuel. (8) Lower Heating Value of the fuel. (9) Delivered: Remotely provided to other rooms through ducting at 10 lb/ cubic feet fuel loading density over one total burn cycle. (10) Efficiency based on delivered heat when allowing cycling from high to low burn to simulate thermostat demand. (11) Optimum overall efficiency at a specific burn rate (LHV). (12) Carbon Monoxyde. Based on overall heat output at 10 lb/ cubic feet fuel loading density. (13) Unless stated otherwise, measures were taken directly at the main power source and include all electrical components present in the appliance. Glass surface - dimensions (Width X Height): 14 3/8" X 10"
Filter - dimensions (Width X Height X Depth): 15" X 20" X 1"
Overall dimension (Height): 67 3/8"
Overall dimension (Width): 36 15/16"
Overall dimension (Depth): 58 11/16"
Door opening - dimension (Height): 9 15/16"
Door opening - dimension (Width): 15 11/16"
Firebox - dimension (Height): 15 7/8"
Firebox - dimension (Width): 20 3/8"
Firebox - dimension (Depth): 25"
Steel thickness - body: 3/16"
Steel thickness - top: 1/4"
Air return plenum - dimension (Depth or Height): 22"
Air return plenum - dimension (Width): 14 1/2"
Hot air plenum - dimension (Depth or Height): 14" - 24"
Hot air plenum - dimension (Width): 26"
Clearance - back wall: 12" : 12"
Clearance - top (measured from the platform on which the appliance is installed)**: 72" : 72"
Clearance - recommended for maintenance on option side: 24" : 24"
Clearance - front: 48" : 48"
Clearance - side wall: 8" : 8"
Clearance - opposite side wall: 24" : 24"